Roast peanuts and remove skin.Keep aside. Take jaggery in a thick bottom vessel and add 5 tbsp of water.Let the jaggery melts. Now make a thin syrup. When syrup is done*.Switch off the stove and take the bowl down on the floor. Add ghee and peanuts.Mix thoroughly and take the peanuts in a flat plate. Wet your hands and make ladoos into your preferred sizes.These ladoos can be stored for long. *To check whether the syrup is done or not take a bowl with water.Pour a teaspoon of syrup into the water.With your fingers gather the syrup into a ball.If a ball is formed then the syrup is ready. we buy this everytime we go shopping..should try it sometime.. They look so great and crunchy, feel like taking a bite into one of them. Do you know that peanut ladoo's are very addictive. I cannot stop with one. I dont have a recipe for it. Thanks for posting this one for me to refer. perfectly done..looks so yummy..the method of checking the syrup consistency is really a good idea. My all time favourite, love it..
Yummy laddoo.. looks tempting and healthy.. perfect presentation!! Ilove these and every time when i go to india i buy from the shops, but never made them home. perfect laddoo s saritha looks so mouthwatering hummm. 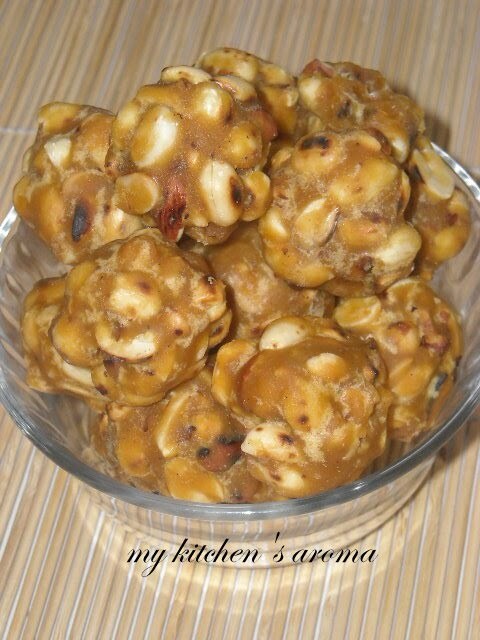 Peanuts and jaggery are such an amazing combination!! This will go wonderfully with a cup of hot tea!! 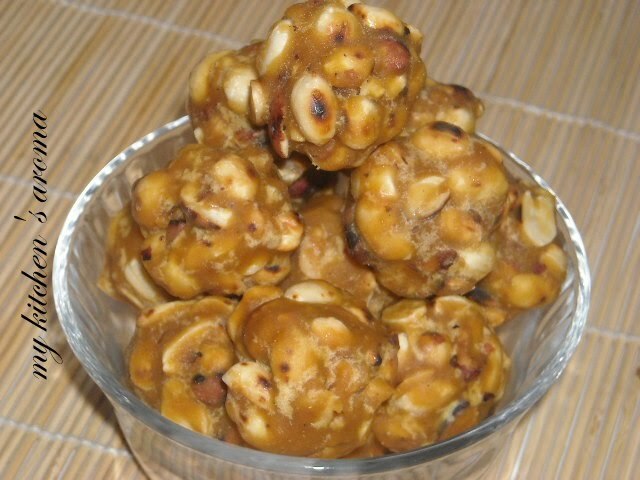 nice snack for evening time ..
Peanut ladoos look delicious nad absolutely yummy. My 1st visit here following your blog.Do drop by simplyfood sometime.